We’d all like to think that size doesn’t matter, but when it comes to mountain bike wheels, that’s unfortunately not the case. Mountain bike wheels are most commonly referred to by their diameter in inches. While the original standard for mountain bikes was 26”, several new standards have emerged over the past few years. First, the 29” mountain bike wheel (commonly called 29’ers) and more recently the “Goldilocks” middle standard wheel size of 27.5”. Numbers are good and all, but what does that mean? Read along and we'll help you choose if a 29er vs. 27.5" wheeled mountain bike is the right choice for you. 29” bike wheels are actually the same diameter at the rim as the 700c standard you may recognize from road bikes, while the 27.5" (also called 650b) standard comes from European touring and tandem bikes. Regardless of where these wheel sizes originated, there are advantages and disadvantages to going to a larger or smaller wheel size. Straightline Speed. Traction. Efficient Roll. This is one of the key arguments for going to a larger mountain bike wheel size. Not all trails are smooth and buff and larger wheels have an advantage here. Angle of attack refers to how high up on the wheel a particular object hits when a bike wheel is rolling over it relative to other sizes. Imagine trying to roll over a stick or small rock with tiny skateboard wheel vs a tractor tire. The skateboard wheel won’t even come close to rolling over it and will get hung up whereas the tractor won’t even notice that it’s there. This is because of the angle at which the object comes into contact with the wheel. All other things held constant, larger mountain bike wheels will roll over obstacles and maintain speed on rough terrain better than a smaller wheel. With a larger mountain bike wheel, you also get a larger contact patch size. This simply means that once the tire conforms to the ground, there’s a bigger patch of knobby rubber making contact. Anything that is aided by more traction like braking, technical climbing, or cornering, is easier with a larger contact patch. Please note: This does not mean that bigger wheels are better at technical climbing or cornering, it simply means that you’ll get more traction relative to a smaller wheel in those situations. Smaller mountain bike wheels, all other factors held constant, will pick up speed faster than a larger wheel. Tight and twisty trails requiring you to pedal out of corners will favor a smaller wheel that picks up speed faster. A wheel is only as strong as the tension of its spokes. The longer the spokes, the less tension and strength. Longer spokes means there’s a longer lever-arm to wrench on them when you case that jump or drop a little catty-wumpus. What you may feel with a larger wheel is more flex but unless you’re a DH racer, dirt jumper or Josh-Bender-esque free-hucker, wheel strength is an increasingly mitigated issue because rim, spoke and hub designs have improved vastly in the past 10 years. The recent Boost 148 development is a great example of improved large wheel stiffness. There’s a lot that goes into what many consider the most technical mechanic in mountain biking. It is generally accepted that smaller mountain bike wheels work towards better cornering in several ways. Being lower to the ground, smaller wheels will take less movement of the arms to produce a lean angle required for cornering. Since smaller wheels are also generally lighter, there’ll be less gyroscopic effect of the wheel righting the bike and fighting against your efforts to lean the wheel. Although larger diameter wheels may hold more traction and speed through a corner, the decrease in agility and lean angle may be seen as a drawback on a twisty trail. 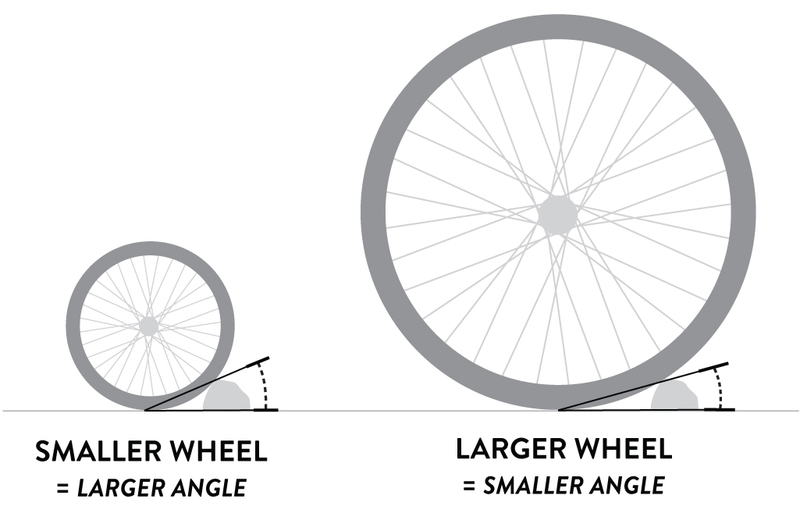 Wheels are a major component to any bike and the size of the wheel affects a lot of other things that you might not think of. In particular, frames need to be engineered around the wheels. In general, bikes with larger wheels will have longer chainstays, wheelbases and taller stack heights than smaller wheeled bikes. Not many bicycle manufacturers produce a size S or XS 29’er for that reason. If you’re 5’7” or smaller, 29’ers are likely to feel too big. Conversely, if you’re a big, tall guy and always feel like a bear riding a unicycle on 26” wheels, bigger 27.5” or 29” wheels may feel more natural. Additionally, suspension components also need to accommodate larger wheels. Fork lowers need to be longer and taller in order to fit larger wheels and as a result, 29’ers tend to have less suspension travel than their 27.5” and 26” counterparts (although the advent of Boost 148 also mitigates this to an extent). Since the wheel size difference is less, 27.5” wheels aren’t usually penalized by their suspension travel like 29’ers. Full travel 27.5” downhill bikes have recently made their appearance. So what's wins the 29er vs. 27.5 debate? That comes down to your preference as a rider. In general, bigger mountain bike wheels (29’ers in particular) are better uphill and in a straight line over rough terrain. The smaller wheels tend to be more nimble and have more suspension travel. One isn’t necessarily better than the other and a lot of rider preference and terrain choice is going to come into play. Like most bike related discussions, sometimes the best way to tell the difference is to throw a leg over and get a feel for each!